Dr. Joel Slutsky is a Urologist with CTMH | Doctors Hospital. Dr. Slutsky completed his education at Universidad Autonoma de Guadalajara in Mexico. He completed a 5-year residency in Surgery and Urology at Rush University Medical Center. Dr. Slutsky specialises in prostate problems, incontinence and treatment for overactive bladder. He also performs pelvic floor reconstruction, sacral nerve stimulation therapy, and surgical solutions for urological problems – his other interests include prostate cancer diagnosis and treatment. In addition, Dr. Slutsky specialises in the diagnosis, treatment, and prevention of kidney stones. Dr. Slutsky has extensive experience in the treatment of kidney stones with the Holmium Laser which has recently been purchased by CTMH | Doctors Hospital. 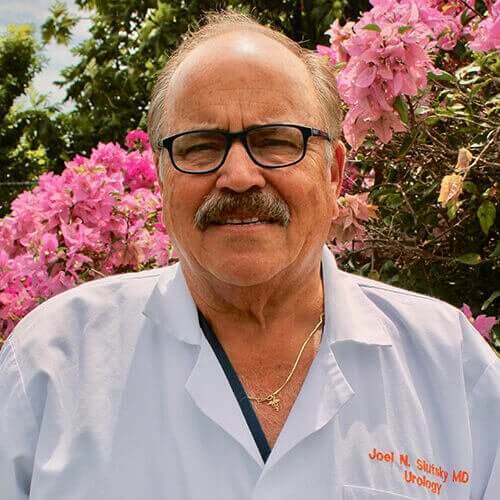 Dr. Slutsky has been treating patients on island for more than 15 years. He recently closed his practice in the Chicago where he was also on staff at Rush University Medical Center. Certified by the American Board of Urology, he is a member of the Chicago Urological Society, Illinois Urological Society, American College of Surgeons, American Urological Association, and American Medical Society. In addition to this, he was also active in the teaching of Urology residents at Rush University. To make an appointment with Dr. Joel Slutsky, call the CTMH | Doctors Hospital Specialist Clinic at 345.949.6066 Ext. 106.